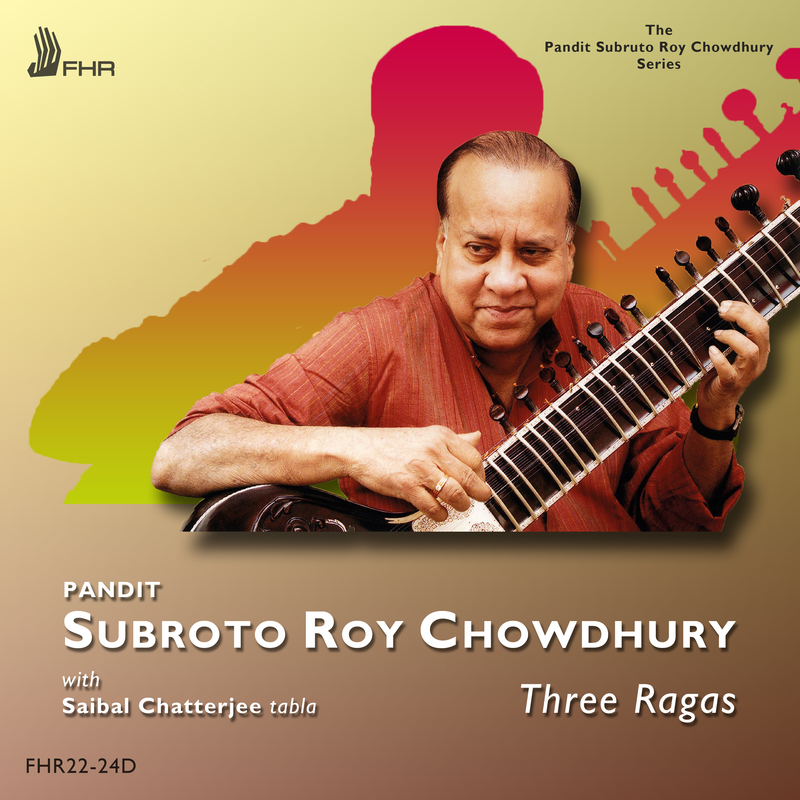 These three ragas are the first set of recordings from a new FHR series called “The Pandit Subroto Roy Chowdhury Series”. These are studio recordings from 2012. Inclined from his teens towards authentic traditional classical music forms, Subroto leaned towards the gurus of yester-years rather than the established artists in the limelight in those days. This led to his close association with Birendra Kishore Roy Chowdhury and Ustad Hafiz Ali Khan. Deeply infatuated with Dhrupad tradition and raag-dari, Subroto stepped back in history to return to classicism under the dominant influence of Birendra Kishore Roy Chowdhury,Veena Sursringar, and Sur-Rabab player of Gouripur. 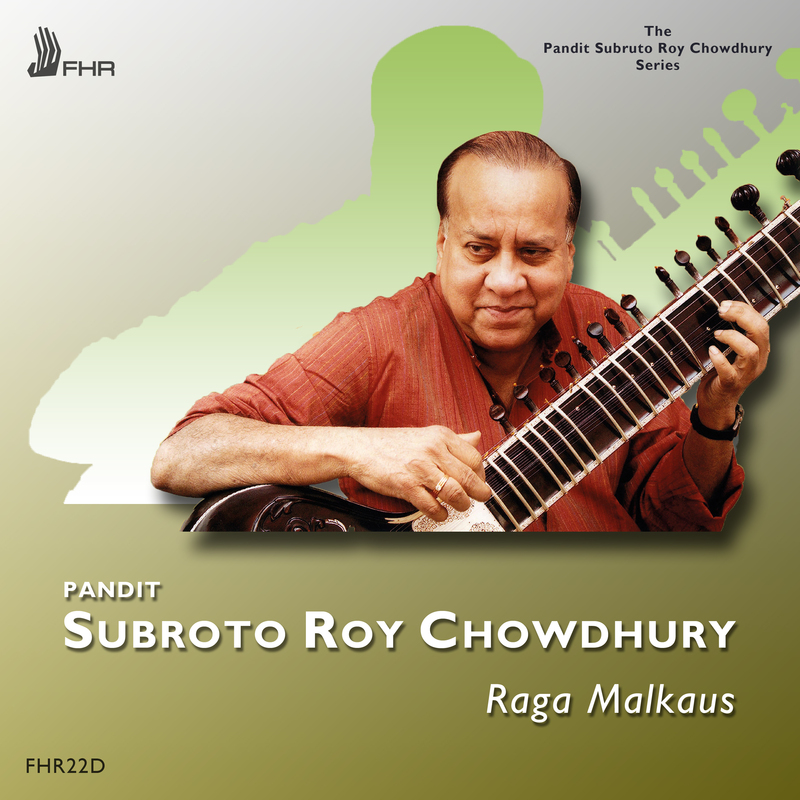 The alap and jod (slow meditative raag elaboration) was Subroto’s first love like that of his guru Birendra Kishore. This drove him to the famous Senior Dagar brothers, Mohinuddin and Aminuddin. Eventually he became a “ganda bandhan“ Shagird (disciple) of Ustad Nasir Aminuddin Khan Dagar, a famous Dhrupad Singer. A formal introduction to Pdt. Radhika Mohan Maitra was followed by muscial training in Masid Khani gats, right hand mejrap bol. banis, mid tempo jod, Bandishi alap, and traditional middle tempo teen tal compositions. Subroto later in life got a glimpse of the Jaipur-Senia Sitar baj of Western India (Pachao or Pashchim Ke Sitar) during his brief stint with Pdt. Bimal Mukherjee. 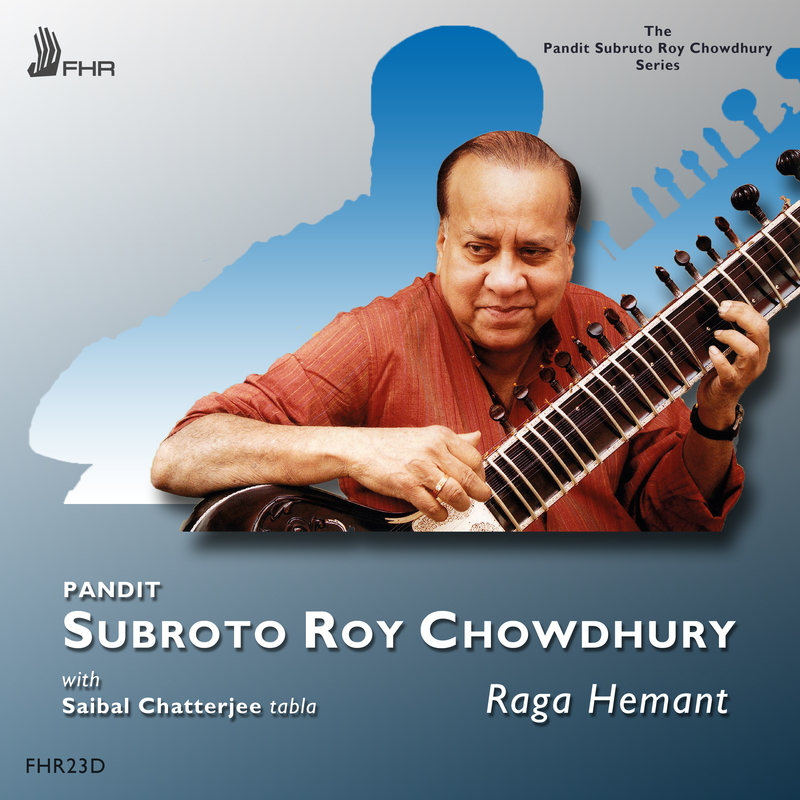 As his association was more with his grand gurus rather than the gurus of his time, Subroto’s style bears resemblance with 19th century Sitar music. 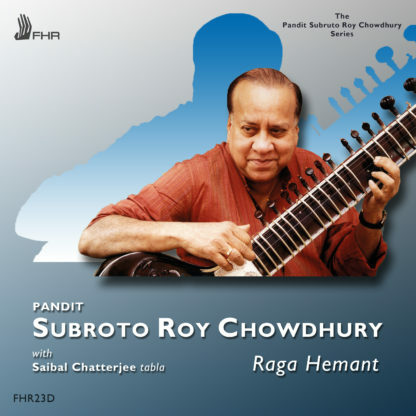 The Smooth Veena Meend Ang and Rababi bol banis are Subroto’s forte. Introduced by the famous music theoretician the late Sangit shastri Suresh Chakravarty to the Calcutta audience in 1964, Subroto never looked back. He won awards in the All-Bengal, All-India, Inter-University, and All-India Radio music competitions. In the 1970’s he started visiting Europe playing for Radio France, BBC, Radio-Television Belgium, the Swiss Radio, WDR and SDR, Germany, and the T.V. Asia U.K. The North Sea Jazz festival in Le Hague, the Leverkusen and the Tübingen Jazz festivals, the Lubljana festival, The Berliner Festtag, and the World Religious Music Meeting sponsored by WDR in Cologne consolidated his position in Europe. 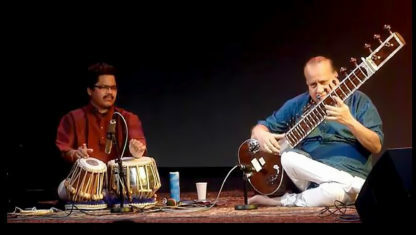 In the USA, he was invited by the Ali Akbar College of Music and Indian Archives. In East Germany, he was the first sitar player to perform, pioneering the way for other Indian musicians to follow. 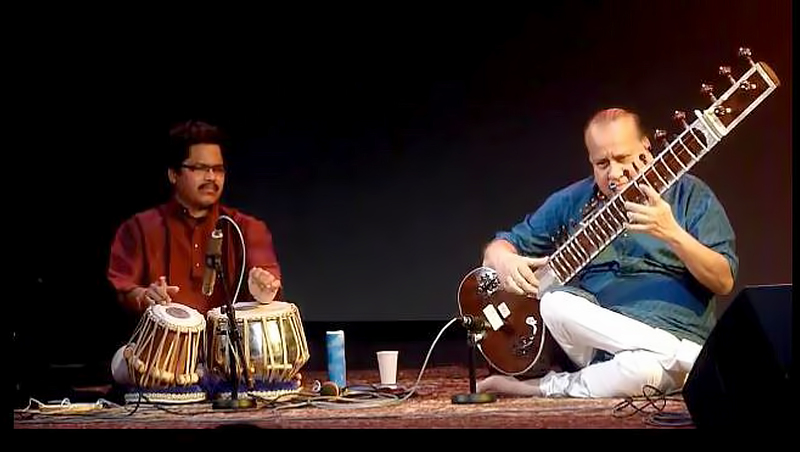 He has today about 300 concerts outside India to his credit, covering Spain, Portugal, France, Germany, Denmark, Sweden, The Netherlands, Belgium, Luxembourg, Yugoslavia, U.K. and the USA. In India, he has participated in most of the important festivals throughout the country as also the National programme of All India Radio several times. He is an active advocate of human rights and has donated the royalties of his first album “CalcuttaMeditation“ to Amnesty International.